The day for which the Sharma family was eagerly waiting arrived a few days back. Anika started crawling on all four (more like an alligator) a few days back and the house was buzzing with gossip about how long we had before she would fall off the bed. Everyone was of the opinion that her crawl was more of a slither and that she won’t be able to pass the single pillow barricades. How wrong we were! It so happened that one fine evening when Geet was stuffing stuff in her overstuffed almirah while Anika sat sprawled in her pillow cage, she suddenly heard a thud followed by a blood-curling wail. Anika had broken the cage and fallen off the bed. There was a sudden buzz in the house. Anika was passed from one hand to another, like a stack of bricks at a construction site. It was one of the landmark days when you realize that your child has crossed a very important milestone. We almost had a party to celebrate the bump on her head. Anika has also started reacting to all the food that is never going to get into her mouth for a long time. She hates her Cerelac and mashed bananas but stares gluttonously at the aloo paratha in my hand. She then licks her lips and makes sound with her tongue as if she has not eaten in months. She stares beseechingly at Geet’s dinner plate but closes her mouth the moment I try some fruit juice on her. She seems to be a pretty good actress. Geet and I left Anika with her grandparents and had some ‘us time’. We watched the desolation of Smaug and had pasta followed by brownie dipped in boiling chocolate sauce and got nostalgic about the good old days when we used to eat chocolate off each… never mind. So, we came back home and I decided to create a Lonely Mountain in our bedroom. The trigger was the fact that Geet was feeling tired and wanted to have a nap. So I turned Anika into Bilbo. I was Thorin, the Dwarf king and Geet was Smaug who was lying under her comfortable duvet which was actually millions and millions of coins. I commanded Bilbo to go into the mountain and find the Arkenstone which was nothing but Geet’s hairclip. Bilbo quietly slipped into the mountain of coins but she wasn’t very quiet. She woke up Smaug but before the dragon could shoot fire at the hobbit, Bilbo snatched the hairclip and pulled it with all her might. 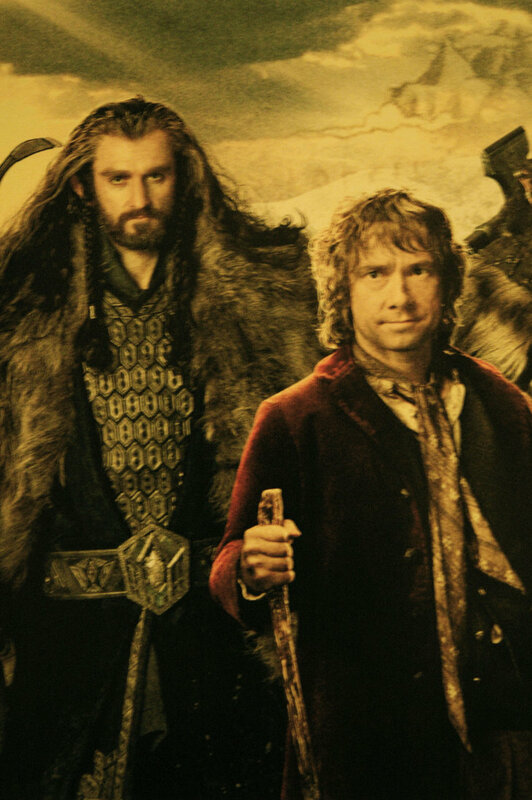 Smaug bellowed and Bilbo and I ran for our life. Thankfully, that was not the day Bilbo fell off the bed but Smaug made us feel sorry that we woke her up. Seven months have gone by and Anika has turned from a sleeping beauty to a roadrunner. It is hard to catch her and make her stay still. As much as Geet and I are scared of the terrible twos, we are also looking forward to having a full night sleep, an act about which we have very faint memories. Recently Anika went through a phase of nightmares and would wake up screaming like the heroine of a Ramsey movie. We had to eat Crocins before going to work during that horrible phase. We have realized that with a child you never know what the next day holds. And as a wise man once said – The smaller the package, the smaller the problems. I find solace in believing that nightmares followed by screams, diaper rashes and hobbitses falling off beds are smaller problems as compared to what lies ahead. You post always transcends me back to 2000 AD -now wasn’t that only yesteday, yet a millenium ago? However, your ex-sleeping beauty seems to have a mind of her own, and I’m not surprised, considering who her father is! I’m waiting to read her blog or whatever it would turn out to be in a decade or so. May God bless her and you all! Haha! Thanks Uma. I hope she picks up reading and writing as a hobby. I take her to the study room almost every day and show her all the novels she has to read one day. I hope that helps. I am sure the ride will get more interesting with time. haha that Smaug refrence made me laugh ! New year wishes to you and your family too! Haha! It is a tapasya. Tell me about it. I still shiver thinking of that phase. I think I will cry for a long time on the day I will get a full night’s sleep. LOL, You go Anika! You definitely have to top this blog. I wish I was living close by, I would have taught you how to beat steel plates with spoons and create a cacophony. Smaug and Thorin can deal with that then! welcome to the team.. :P.. dont worry more interesting things are on the way to come.. :).. Lets hope that I get it some time soon. Actually laughed out loud at your descriptions! They were almost as joyful as the lead protagonist of your post! She is not very joyful in the dead of the night. Believe me. These are beautiful days Amit and your post shows you are enjoying them to the hilt. Yes these are beautiful days except that I feel that I haven’t slept since ages. That was a cute description, Amit. For sure, ahead lies more fun 🙂 Once she starts standing up and walking, there’s no stopping her. And sleepless nights, ask me about it. I am still terrified about them. That was a lovely peek into your life Amit! More power to Bilbo -err..- Anika! Being a girl, I guess I gave my parents the toughest time in my late teens! So you have some time to enjoy. hahaha cannot wait for the next phase and the next events! I lost my original comment :(. But here I am back. Re-read the post and had a good laugh once again. I also remember the first time, my son had a fall and we had all gone in the panic mode. Just a few days later, it became a common occurrence. God, these kids give us all kinds of scares. And don’t remind me of a good night’s sleep. My husband and I struggled with that too. I just love these posts of yours — so humorous, each musing what every parent can relate to! God bless Anika! Thanks for coming back Rachna! Nowadays we are extra cautious around her. Everyone leap at her the moment she crawls towards the edge of the bed. 🙂 It is a funny sight. I am just waiting for a full night sleep to happen. Whenever that happens, I am going to wake up in the morning and cry. As for a goodnight’s sleep, some days they were! Sigh! It is a shock when it happens for the first time especially because you think you have taken all the precautions. I am actually busy with my second book. 🙂 I am trying to finish the first draft by June. Oh wow! that’s great. And what is the update on the first book?? I missed the development here. Congratulations! (Sorry for the late wishes.I was totally out of blogging for long time now). I could connect to the little one for falling off the bed. I could recollect my memories of falling off bed and getting a bump on my head probably when I was 3-4 yrs old. (the bump stayed for a good one year). Hope she is doing well now. Lots of good wishes. Cheers! .